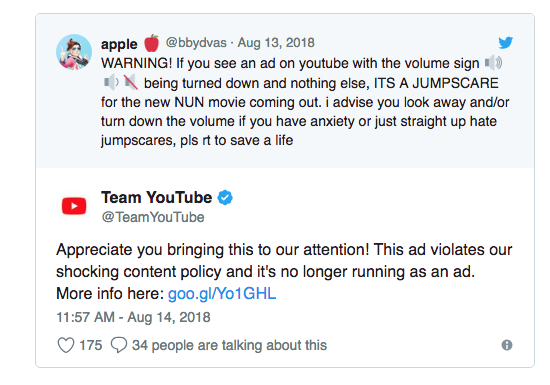 The Google-owned YouTube has been forced to pull an ad for the upcoming horror flick The Nun after it scared the bejeebers out of unsuspecting viewers. The film, co-written by Australian James Wan, centres on an inexplicable suicide of a nun in 1950s Romania and the ad for the film was so frightening that YouTube was apparently flooded with over 130,000 complaints from people who’d had the misfortune to view it. YouTube’s own advertising policy (which you can read here) also states that ads featuring “violent language, gruesome or disgusting imagery, or graphic images or accounts of physical trauma” as well as promotions “that are likely to shock or scare” are not allowed.